Today, children are being widely socialized online almost from the moment of conception. By promoting the use of technology into our most intimate spheres of life, we validate its very presence and send a false message to our kids—that they are always safe online. Simply put, Strangers + Technology = Access to Children. The decisions young people make online can have serious—if not lifetime or life-ending—implications. 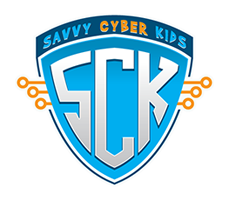 Savvy Cyber Kids offers strategies to parents and educators to put boundaries around appropriate technology usage. By understanding online privacy, children can protect themselves. There was a time when the childhood lessons of ‘don’t talk to strangers,’ and the ‘golden rule’ was enough to keep kids safe. These lessons could be applied to more mature circumstances as the child aged and because kids learned them young, they were better equipped to make safe decisions when they got older. But times have changed. Technology happened. Today, kids have unfettered access to internet-enabled screens, likened to taking the front door off the family home and inviting strangers—potentially dangerous ones – in to play. Parenting has never been easy. But parenting in the Digital Age has brought with it new challenges that must be addressed to ensure the health and well-being of young people. The mistakes our youngest digital citizens can make – posting something that gets them kicked off a team or refused entry to the college of their choice or connecting with a child predator who grooms them over time — has the potential to haunt them for the rest of their lives, or worse yet, put them in a life or death situation. The reality is that there is no one-stop prescriptive formula for keeping kids safe online. Technology changes very quickly, so the approach of merely advising on the apps or platforms to use/avoid or specific direction on parental controls is not effective enough. What works is treating the virtual world like the playground that it is and establishing safety protocols much like the ones children learn at a very young age – before they are allowed go play with neighborhood kids on the playground. And then refreshing these lessons again and again as the child ages. Parents and educators need to guide young people spending a large part of their lives immersed into a screen. It’s important to grow up cyber aware and be safe in the virtual world. It’s also equally important to embrace the principles of Cyber Safety & Ethics—to understand the significance of respect and empathy as it relates to digital decision-making. School and community programs for children in preschool through high school, parents, educators, seniors and sports teams. Add a description here… SCK in-home program, blah blah blah….